Solar Powered Water Pumps use generated electricity to pump water. Common applications are water for livestock, crop irrigation, drinking and cooking water supply. During hot months and in hot areas the requirement for water is high. Private households and farms need stable and consistent water supply. 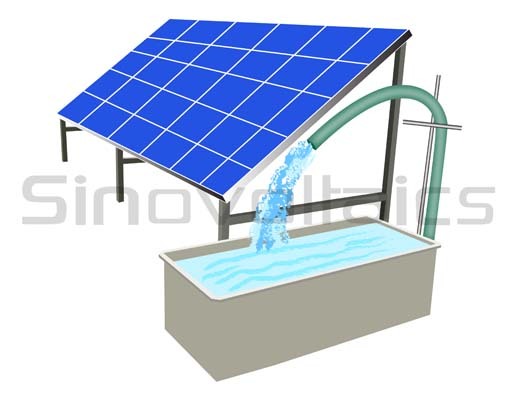 Solar water pumps are electrically driven pumping systems, powered by photovoltaic panels. Correct sizing of the pump and controlling devices is important, as the water supply or harvest may rely on constant water supply. The sizing of the Solar Powered Water Pump needs to be done according to location and usage of the system. What components are used for Solar Powered Water Pump installations? 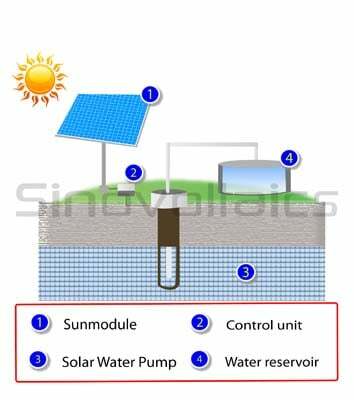 A solar water pump installation is a fairly basic system and typically consists of a water pump (submersible or surface pump), solar panels and tubes. Most solar water pump systems don’t use batteries. Usually the water level will determine which pump to use. Different types of water pumps can be selected to be used in streams, wells or in ponds. Submersible water pumps can be used to lift water from great depths of up to 700feet deep. Surface water pumps can be used to pump surface water of 10-20 feet deep. The best way to select the right components is to review the amount of water required per day. Based on the number of gallons or liters required per day, one can select the right water pump and then see the total power required that needs to be produced by the solar panels. The pump manufacturer will provide information on the number of watts that are required to produce the desired water flow. After selecting the size and type of the solar pump, use the available information to calculate the watts of the solar panels. To increase the pumping volume and time, the solar panels can be installed on trackers. With the use of solar trackers the output can increase with up to 30%. A water pump does not necessary require batteries. To save costs, the majority of solar powered water pumps can run directly from the solar panels. Electricity aimed at running the water pump is not stored in batteries, but the water is instead stored in a water tank or pond. This way the water is stored and can be used anytime required. It enables people to manage their drinking water supply, livestock watering, irrigation, and other residential applications. Usually the need for water is greatest during the hot sunny days. During these peak times the pv panels also produce most power and most water will be pumped into the storage tank. Due to the simplicity of solar powered water pump systems, this technology is reliable, and requires little maintenance. where can l find my complete set solar water pump in South Africa ? This site are so useful. Then I have a one question. how to find and calculate solar panel watts in the 1hp Submersible pump. I like the solar water pump. Where can I find it.